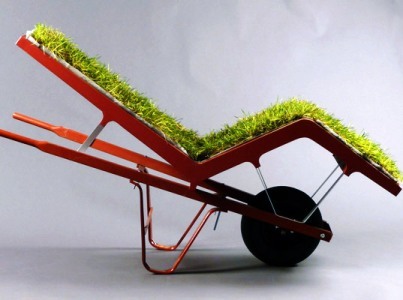 The Chaise Lawn Chair was designed by Deger Cengiz. You can actually see the chair on exhibit at The Cooper Hewitt National Design Museum in New York city. The chair is made of wheel barrel parts, wood and sod and you can actually order one. Now I know this is an extreme view of green design and shows a humorous side to it, but as a designer I do take designing green very serious. Throughout the green design movement I have been interviewed by editors who have asked me if my clients were concerned about using green products. As I pondered the question and answered it honestly I had to say, no. My selections room is filled with green products, from bamboo cabinetry to recycled glass tile and lava stone to name just a few of the green materials available. As I evaluated why my clients were not concerned with requesting green products it hit me like a ton of bricks. When it comes to design their main concern is aesthetics. They have a dream of what their new kitchen or room will look like and that is their main focus. I now introduce my clients to green alternatives and give them the option to pick green products. It is important as a professional designer to educate people about eco friendly products because I believe we should all practice protecting our environment. Now my clients are informed and have the knowledge to be more environmentally friendly when building their new homeor remodeling their existing home. I would like to share some interesting products that I think you will find to be beautiful and friendly to our environment. 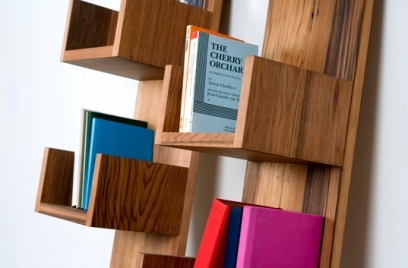 Designer Deger Cengiz constructed these shelves from reclaimed redwood salvaged from a dismantled New York water tower. The simple wood panels are joined together without any screws or hardware. Installation is as simple as finding the wall space to lean them against. 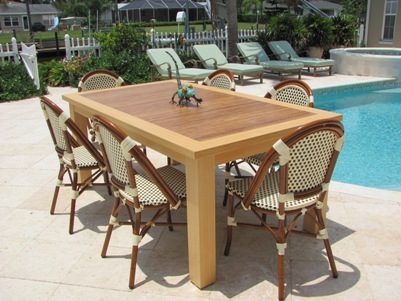 I designed this patio table for under a lani. Bamboo is one of my favorite green materials to work with. 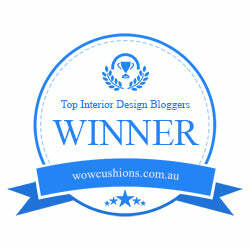 I love the look of the bamboo and its tropical nature is perfect for designing in coastal areas. 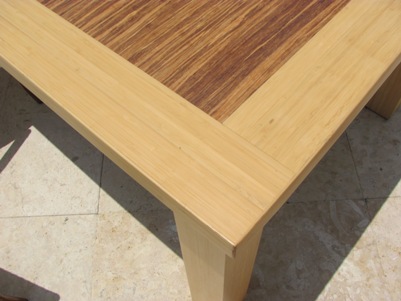 A closer look at the table reveals a light pigment bamboo laid on an edge grain. The center pattern is called tigris and it is made up of strands of light and dark colored bamboo. The company that I used to make the table is Greenworks Cabinetry which I feature as one of my green products in my studio. Concrete is another green product with many uses. 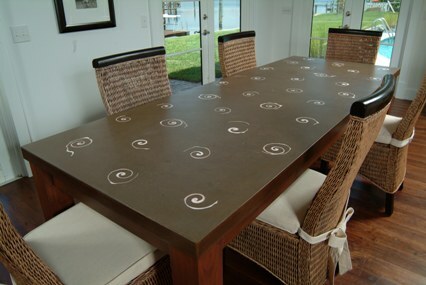 I used cocoa stained concrete with laser cut conch shells embedded. The counter top was made by Corcrete and the base was made by Dutch Made, Amish owned and operated. This portable LED lighting system known as the Halley’s Comet comes with its own case and is a simple click in place system. 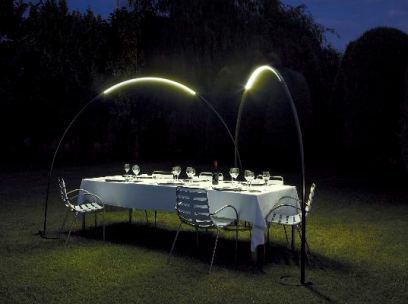 Great for lighting out door spaces and is eco-friendly.